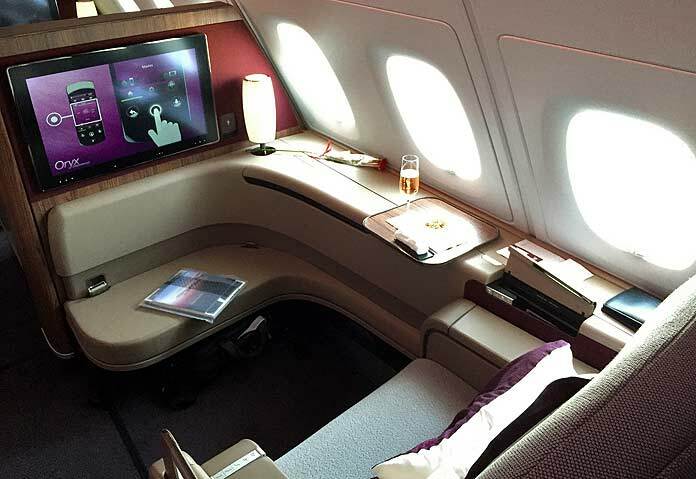 A free airline upgrade to business class or first class is the holy grail for many travellers. We would all like to buy a dirt-cheap discount economy ticket and then get ourselves upgraded or ‘bumped up’ into a premium class. After all, who doesn’t want the free airport lounge access, flat seats and superior VIP service both on board and on the ground. The airline class system is effectively an elitist hierarchy where the majority will fly in economy (coach) class. Many people are sensitive towards class distinctions and value-for-money. Economy class is generally cramped and uncomfortable, particularly on long flights. Business class and first class airfares often sell at a significant premium to economy fares. The average flyer will happily pay $600/£450 for a coach seat on an international long-haul flight but would likely never pay $3,000/£2,250 for a business class seat. That happens to be a fare ratio of 5:1. A free upgrade to the more comfortable business class cabin is perceived as very valuable to an economy passenger. However the actual cost to the airline to upgrade an economy passenger to an empty seat in business or first class is marginal, perhaps only $50-$100 – hence the reason that free airline upgrades can often happen. With millions of passengers flying worldwide in different classes it is inevitable that airlines will sometimes have no choice but to upgrade the odd customer to a higher class. Whilst the free airline upgrade is sought-after, the reality these days is that it rarely happens to the “average” passenger. Such operational upgrades (or “op-ups”) are mainly the result of overbooked cabins. These upgrades are often already decided automatically by computer algorithms well before the flight departs. But first, let’s take a closer look at the mechanics of an operational upgrade process. Airlines routinely oversell seats on flights in order to maximise revenue and increase load factors. This causes some concern amongst the travelling public however it does probably help keep airfares a little lower. Most airlines use yield management software which calculates the predicted number of no-shows on a specific route at a certain time and date. In other words, it works out how many tickets they can oversell on a flight. Every so often there will simply be too many passengers turning up at the airport and not enough available seats on the flight. For example, consider an aircraft with a seating configuration of 127-39-42-8 in economy, premium economy, business and first class, respectively. Now, say the airline has actually sold 146 economy, 51 premium economy, 19 business and 3 first class tickets on a particular flight. We then need to play the airline equivalent of musical chairs and re-jig the cabin assignment. The situation? We have 5 unsold first class seats and 23 unsold business class seats – a total of 28 vacant seats in the premium classes. On the other hand we have 12 oversold premium economy passengers and 19 oversold economy passengers. That’s a total of 31 oversold seats. The solution? You can see immediately that we have 3 passengers (31-28) who will not be able to fly. We have to find 3 volunteers who are willing to take a later flight with a suitable level of compensation to sweeten the deal. That leaves 28 oversold passengers and 28 vacant seats. Now the simplest solution would be to offer 28 upgrades directly into the vacant seats. However most airlines play fair and will generally only upgrade 1 class up. First we can upgrade 5 business class passengers to first class – which leaves 28 open seats in business. We fill these by upgrading 28 premium economy passengers to business class, leaving 16 open seats in the premium economy cabin. Finally we can upgrade 16 economy passengers to premium economy thus filling the entire plane. Full plane, 3 offloads, 49 upgrades processed, job done. Obviously this is a simplified example as in a busy hub airport with many connecting passengers the precise numbers can be more fluid with no-shows and late arrivals. This uncertainty is the actually one of the best way the average passenger can circumvent the standard upgrade rules. Because airlines hate delays and sometimes decisions need to be made quickly at the gate to get the flight away on-time. So how does an airline normally decide which passengers to upgrade? 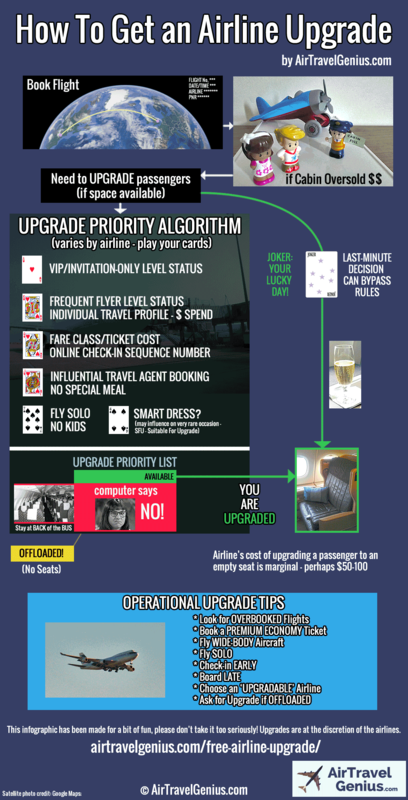 This list shows that to increase your upgrade chances you should be a member of your airline’s frequent flyer program and try to attain the highest possible status. At the very least you should always join the airline program which will give you immediate priority over any non-members. Also consider the distribution of members in a standard frequent flyer program. Say there are a total of 10 million members – you can expect about 120,000 (1.2%) mid-tier members, 5,000 (0.05%) top-tier members and 500 (0.005%) invitation-only members. Of course, elite members happen to fly a lot more often than standard members, so their relative density on any given flight will be a lot higher. This is discounted by the fact that many will already be sitting in the premium cabin. Now to reach invitation-only status can be quite a challenge – unless you are a corporate high flyer, senior civil servant of a banana republic or Mr. George Clooney himself (aka Ryan Bingham)! British Airways has its invitation only Premier membership, Qantas has a similar Chairman’s Lounge program (given to all serving Australian MPs, no less) and Emirates has IO (Invitation Only). In the US there is Concierge Key from American Airlines, Delta 360 from Delta Airlines and Global Services from United Airlines. For most flyers getting top-tier status in your program is probably the single best thing you can do to increase operational upgrade chances. In addition, top-tier members can get other upgrade bonuses – priority clearance when requesting an upgrade using points or miles and perhaps some complimentary upgrade vouchers. For example, American gives its Executive Platinum members up to 8 one-way system-wide upgrades annually; Lufthansa HON Circle members get 6 e-upgrade instruments on attaining and renewing the status. Most of the US programs give top-tier flyers automatic (space-available) domestic upgrades. Who Gets the Free Airline Upgrade? In the case of individual travel profiling this could be scored on how much the passenger has spent or flown with the airline that year. Alternatively a more complex profiling system could be in place. British Airways for example ranks each passenger by a Commercial Individual Value (CIV) score between 0 and 100 which depends on status and spend. Executive Club Gold members who fly 5,000 tier points in 1 year get designated as Gold Guest List, with a CIV allegedly of at least 97. You need 3,000 annual tier points to retain that status. A Gold member flying London-Los Angeles return in Club World (business class) would earn 280 tier points. So 5,000 tier points would be the equivalent of 18 such trips in a year! On top of this BA has a special upgrade list program (known as the Discretionary Upgrade Tool) which is also used as a marketing vehicle to selected passengers who may be converted into higher revenue customers. For example, a mid-level member (BA Silver) who flies economy regularly could be given a free taster to business class in the hope that they will purchase business class more in the future. So having status and authority within the airline will increase your chances on the official upgrade list. Airline booking systems are also getting smarter. Rather than offer free operational upgrades, many international airlines will first try to sell cheap upgrades to flyers in the days leading up to the flight. Upgrades can be offered at a fixed price (and cheaper than buying the business or first class ticket outright) or auctioned off to the highest bidder. This is done online via email, manage my booking or online check-in, at the airport check-in kiosks or at an airline desk (check-in, lounge or gate). Another strategy airlines have these days is to offer heavily discounted business class tickets to fill their premium cabins. This obviously reduces the chance of upgrades as there will be less business seats available. If you are pre-upgraded (at check-in or beforehand) to the premium cabin you can expect to get access to the airline’s lounge at the airport. 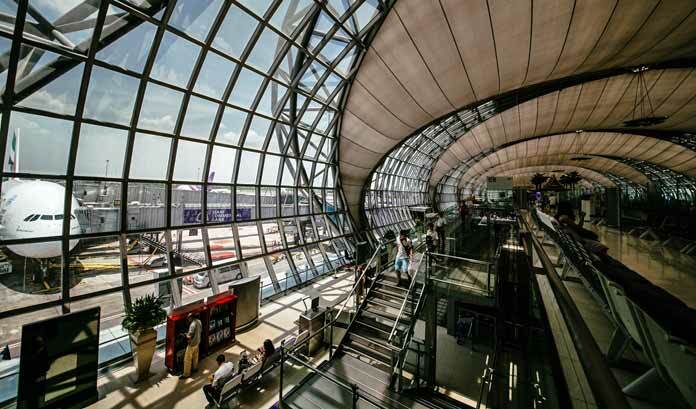 However if you are only upgraded at the gate last minute then lounge access is not going to be viable – although an arrival lounge may be available at your destination. If travelling economy class, it is possible to “upgrade yourself” on the lounge front by purchasing access to a paid lounge. There is also the Priority Pass option, an annual membership program which allows free access to 1,200 lounges worldwide, whatever class you are flying in. Click here for a special 10% discount on Priority Pass membership. 1. Look out for full or overbooked cabins on flights – You will not get upgraded if your flight is half-empty. Ideally you want a full economy cabin and an empty business cabin. Flights around holiday periods (such as Thanksgiving in the US) can come under this category as business travel recedes. Now if booking well in advance it is going to be difficult to know exactly what the load is come flight time. And flights booked closer to departure tend to be more expensive. It’s probably best to just book your flight as usual and then monitor the flight load as the departure approaches. This is possible using online class availability tools (eg Expertflyer, KVS – both subscription services) or checking live seating maps on some airline apps. Watch for overbooking signals such as the airline selling upgrades online before the flight. 2. Fly wide-bodies – Op-up chances are generally greater on a wide-body aircraft (Boeing 747/767/777/787 and Airbus A330/340/350/380) with plenty of premium cabin seating. Business class seats on standard narrow-body planes like the Boeing 737 are not much better than economy and are in shorter supply – especially on planes where the divider between business and economy is movable. Be aware of occasions when a larger aircraft type is substituted on your flight route. It could well be that some original economy seat assignments numbers are then located in the business cabin of the larger replacement aircraft. 3. Fly solo – Upgrades are more often than not given to lone travellers rather than groups. Only when there are a number of seats available it is sometimes easier and quicker for the airline to upgrade a party of travellers on a single PNR. Note that travelling with young children reduces your upgrade chances to almost zero. 4. Book a premium economy ticket – There are a growing number of airlines which have premium economy seating – Aeroflot, Air Canada, Air France, Air New Zealand, Alitalia, American Airlines, ANA, British Airways, Cathay Pacific, China Airlines, EVA Airways, Garuda Indonesia, Japan Airlines, LATAM, Lufthansa, Qantas, Singapore Airlines, Turkish Airlines and Virgin Atlantic. The number of premium economy seats is limited and you will also be deemed as a higher revenue passenger. Any potential overspill from an overbooked economy cabin could result in you being upgraded to business class. The Upgrade: New York-London Heathrow British Airways Boeing 747 party of 3 upgraded from premium economy (World Traveller Plus) to business (Club World). 1 of the party was a standard, non-elite Blue Executive Club member, the other 2 non-members. Reason for upgrade: luggage was lost on outbound sector and didn’t arrive for 2 days; marked in booking, automatically upgraded at airport check-in. 5. Bad service, hello upgrade? – Free upgrades can sometimes be given if you experience a reduced service level – particularly if you have another flight coming up. This was the case above where the combination of lost luggage on a premium economy ticket was enough for the airline to offer an upgrade as compensation. On-board upgrades are possible (but rare) in the event of a broken seat where there is no other possibility but to move to another class. 6. Don’t order a special meal – In general a special meal cannot be upgraded with you. Airline meal numbers are tightly controlled and an airline would rarely serve a special economy meal in business class. 7. Check-in early – Check-in online at the earliest opportunity (usually T-24 hours). A few airlines are known to use check-in sequence number as one differentiator on upgrade lists. An airline may also need to start pre-upgrading passengers a number of hours before departure and would choose those that have checked-in already. Checking-in early could also mean getting a sought-after exit row in your class. This can give you some extra leverage in the upgrade stakes, as the airline may want your seat for a late arriving elite member flying economy. 8. Board late – It could well be that on a busy/overbooked flight with many late arriving passengers (including those from flight connections), upgrades are still being processed up to the very last minute. Hanging back until the last possible moment can sometimes result in you getting a shiny new business class boarding pass. 9. Pick your airline – British Airways, Cathay Pacific and Emirates are examples of major airlines that are well known to offer operational upgrades when required. As described above, BA uses complex software to process upgrades; Emirates is based at a major fluid hub (Dubai) and has many wide-body aircraft with large business cabins. On the other hand Singapore Airlines is very protective about their premium cabins and rarely gives free upgrades, even to their top-level members. 10. Dress well? – Dressing up is still commonly presented as a free upgrade strategy. If you have a really smart suit and a time machine then get yourself back to the year 1978 – you will increase your free airline upgrade chances considerably!! In those days gate agents had more power and there were no frequent flyer programs or computer algorithms to contend with. Still today at London Heathrow you can see hundreds of well-dressed chancers hoping for that elusive upgrade – 99.9% of whom still end up flying at the back of the bus. That said, the old adage “comment if SFU” – Suitable For Upgrade – can apply on very very rare occasions, where the airline pre-selects you for an upgrade but the ground agent has some discretion to make sure you look the part first. So dressing in smart-casual but comfortable clothes will certainly do no harm – but this is absolutely not a serious upgrade tactic. 11. Should you “ask nicely?” – Now there’s nothing wrong with being polite and courteous to airline staff. However, in this day of struggling airlines, thousands of elite status passengers and upgrade computer algorithms you are highly unlikely to be granted such a request! You will probably annoy the agent who has heard this already from many non-status economy passengers that day. And often the desk agent would actually require authority from a senior manager to process an upgrade. However, one situation where you might want to ask is if you are volunteering to be offloaded from an overbooked flight. You are doing the airline a favour and may receive cash compensation. Enquire about the possibility of being upgraded on your re-booked flight. If you are having to pay a lot of money for excess baggage on a flight you should ask for an upgrade. Or at least check the cost of the upgrade to business or first class as it has a higher baggage allowance. 12. The infamous honeymoon upgrades – Firstly, if you are on a once-in-a-lifetime trip then why not book a business class seat in the first place?! Airlines are certainly under no obligation to give you any special treatment. Now there’s no harm getting a note put under your booking and hope that the agent can bypass normal upgrade procedures. However, there’s a much greater chance of an upgrade at your hotel rather than on your flight. 13. The world’s top secret for guaranteeing you sit in business class every time… buy a business class ticket! This almost never fails unless you get downgraded or offloaded. You will earn more frequent flyer miles and status points as well. Last updated 22 November 2018.